KÖMMERLING PremiDoor lift/sliding door system allows you to design openings, e.g. for the garden or terrace, providing you with full freedom to determine the amount of light you want. Your home opens up and becomes more spacious. Thanks to many design options and remarkable measurements- with sash sizes up to 3.0 m wide and 2.5 m high – it is the best choice for those who are looking for a product customized for your architectural requirements. KÖMMERLING PremiDoor is a genuine premium product. Its appeal lies in its lean design look, its timeless character, and its technical features. Maximum values for thermal and sound insulation, stability and weather tightness are guaranteed, just as is reliable functionality and high user comfort. The design of the mechanism makes sliding even the largest elements easy and quiet. PremiDoor terrace doors can incorporate innovative 2-chamber glazing sets which produces excellent heat and sound insulation of the barrier. Below are the color profiles KÖMMERLING PremiDoor. Profiles can be coated on one or both sides. Depending on the color and options unilateral or bilateral waiting time for order may be extended. Color charts are available in our offices. All the detailed information, please contact our staff in sales offices, by telephone or electronically. We invite you to contact us. 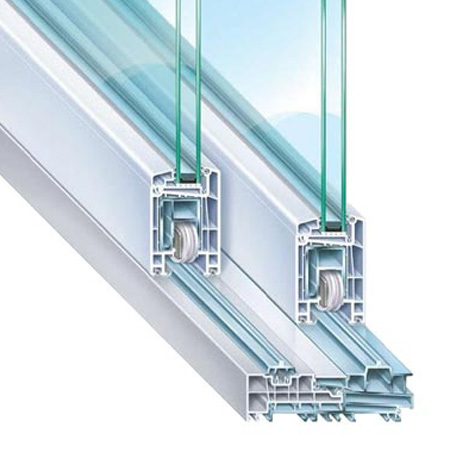 Our window profiles are stabilized by environmentally friendly calcium and zinc instead of lead. This way, not only do we care about the environment but also ensure the long-lasting quality of your windows – they are even more weather-resistant, keep their gloss for longer, and are easier to maintain. Here’s concern for the environment with benefits for you.